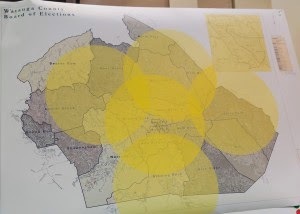 Watauga Board of Elections honcho Bill Aceto had a map of Watauga County with yellow circles on it at the March 5 meeting of the board, which passed 2-1 the Republican plan for Early Voting in the May 6 primary, a plan based on those circles. The five equally sized circles, radiating out from Aceto's five proposed Early Voting sites, were meant to prove that Aceto had considered "geography" in his proposal. In this mountainous county, Mr. Aceto's yellow circles also disregard that all areas within one of his radiuses do not enjoy "inter-connectivity." The shortest distances between points in Watauga County are rarely feasible for travel. You have to follow existing roads, and Mr. Aceto's maps show no existing roads. His circles are meaningless fantasies. Aceto is required by statute to consider geography. He's also required to consider demography, where people actually live. His map does no such thing. His map wants to assume that every radius contains the same density of population, which is preposterous. And what about the significant slices of Watauga County that aren't within the radius of any of Mr. Aceto's circles? How are we to regard their role in the scheme of magic circles? A man can stick a compass on a map and draw circles all day. It's not going to conceal the real purpose of why he stuck his compass where he did … to make it more difficult for one class of voters to get to the polls and to advantage his own party in upcoming elections.